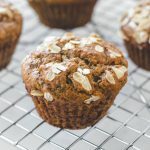 This Flourless Banana Oatmeal Muffins recipe is simple to follow, gluten free and all natural. The muffins are made with a banana, peanut butter, honey and oatmeal. Being full of fiber, healthy fats and protein makes them a great option for a snack too! Preheat oven to 350F and prepare muffin tin with liners. In a large bowl, combine all dry ingredients and mix until combined. In another bowl, mash banana until no chunks are present. Whisk in eggs and add remaining wet ingredients (peanut butter, milk, honey and vanilla extract). Pour wet ingredients into dry and mix. Once combined, add in chocolate chips. Fill muffin cups about 3/4 the way full. If you have batter left over, evenly pour the remaining into muffin cups. I used unsweetened vanilla almond milk, but any milk should be fine. After adding in the chocolate chips, pour the batter into the muffin tin right away. If you let the batter sit, the oat flour will absorb more liquid and the muffins won’t be as soft. You can store them in an airtight container on the counter for up to 5-6 days. After 5-6 days, I recommend putting them in the refrigerator. Every oven is different, be sure to test doneness by sticking a toothpick in the middle of a muffin. I have not tested these using a flax egg. If you do, comment below!